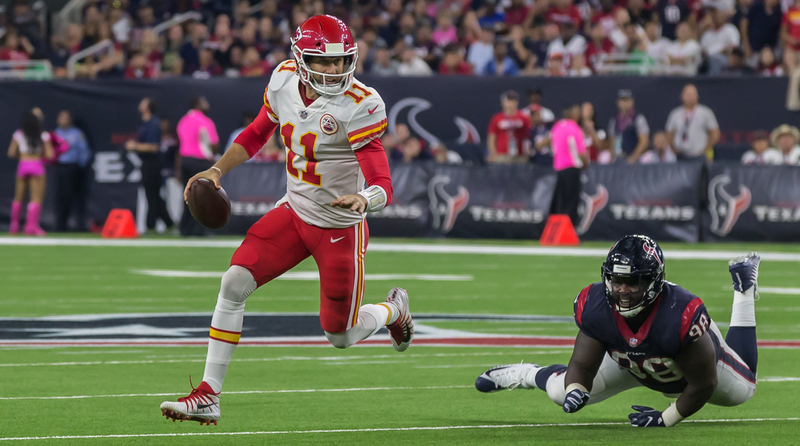 Behind Alex Smith, the Chiefs have reeled off five straight wins to start the season and are the NFL’s only remaining unbeaten team. Alex Smith, quarterback, Kansas City. The MVP of the first five weeks is having far and away the best season of his life. His 76.6 percent accuracy is absurd; the current record for accuracy in a season is 71.6. Smith continues to throw the ball well downfield, and his three touchdowns and 324 yards led the last unbeaten team in football to a 42-34 win over the plucky but beat-up Texans. Cam Newton, quarterback, Carolina. The former MVP is starting to play like one again. His Week 5 league-high 355 passing yards, with three touchdowns, led 4-1 Carolina past Detroit 27-24 win in a week full of self-made distraction for Newton. Vontaze Burfict, linebacker, Cincinnati. Marvin Lewis will tell anyone who’ll listen how valuable Burfict is, and how much he was missed during his September suspension for the brutal hit on Kansas City running back Anthony Sherman. Burfict’s 13 tackles and one sack were vital to the Bengals’ 20-16 win over Buffalo in the Cincinnati rain Sunday. Adam Vinatieri, kicker, Indianapolis. Vinatieri bookended the game perfectly for the Colts. His 52-yard field goal in the first quarter accounted for the first points of the game; his 51-yard field goal in overtime gave the Colts a 26-23 win. And an extraordinary career gets more extraordinary. Vinatieri turns 45 in December. Since turning 41, he has made 16 of 19 field goals from 50 yards and beyond. Here’s the interesting thing to me: In his first six seasons, Vinatieri hit on 80.4 percent of all field goals. Since turning 41, he’s made 84.2 percent of his 50-yard-plus kicks. Now that’s impressive. Todd Bowles, head coach, New York Jets. Coaching in the NFL cauldron is a difficult thing anyway. Doing it with a bad team in New York is exponentially more distracting. I’ve got tremendous respect for Bowles, for getting his team to 3-2 with a quarterback put on the street by the Cleveland Browns, a tattered offensive line, and a defense that gave up 45 points in Week 2 in Oakland. Bowles has proven against the odds that coaching, and a smart plan, matter. Nick Folk, kicker, Tampa Bay. The difference in New England’s 19-14 win over Tampa on Thursday night? Simple: Stephen Gostkowski, 4-for-4 on field goals. Nick Folk, 0-for-3 on field goals. Folk missed kicks from 56, 49 and 31 yards. The gory details … New England up 13-7, late second quarter: Folk missed a 56-yard prayer, wide right. New England up 16-7, early fourth quarter: Folk missed a 49-yarder, wide left. New England up 16-7, midway through the fourth quarter: Folk missed a 31-yard field goal, wide left. Ben Roethlisberger, quarterback, Pittsburgh. For his five interceptions, and for a 21-point loss to the Jaguars at home. Both stunners. —Cowboys owner Jerry Jones, to the Dallas Morning News. —Civil rights leader Jesse Jackson, to the Indianapolis Star after the vice president walked out of the stadium following some 49ers kneeling for the national anthem. —David Letterman, at the unveiling of the Peyton Manning statue in Indianapolis Saturday, on Roger Goodell. That held true Sunday, as the Giants fell to 0-5 with a loss to the Chargers. In their past 49 games, the Cleveland Indians are 40-9. In their past 49 games, the Cleveland Browns are 9-40. Team (Kicker) PAT Made-Att. FG Made-Att. All Kicks Made-Att. All Kicks Pct. Ian Rapoport reported over the weekend that the Bucs will have kicker tryouts for Nick Folk’s job today. Folk’s still employed, but who knows for how long. A word about NFL TV ratings. Several words, actually. The NFL is concerned about them. Some people in the league are hugely concerned about them. They should be. A year ago, when the ratings were tanking, most media cognoscenti said it was because the rancorous presidential campaign was sucking all the TV air out of the room, and the marginal football fan was watching Fox News or MSNBC or CNN instead of football. So we’ll skip 2016 ratings for the purpose of this exercise, and compare 2017 to 2015. In Week 4, ESPN’s Monday night rating for the Kansas City-Washington game was 19 percent lower than the Detroit-Seattle Week 4 game in 2015. NBC’s Sunday night Indianapolis-Seattle rating was down 32 percent compared to the Dallas-New Orleans game in 2015. Now, you can say a lot about that second comparison, namely that any game with Dallas will get a good rating. But no matter what the matchup, to be down by a third, week over week, from two years ago is notable. Now, I doubt in NBC’s case that a third fewer people watched this year’s game in Week 4 than watched in 2015. People who follow the ratings game closely tell me that some fans are cord-cutters who have found ways to watch that aren’t measured by traditional rating services. Still, the numbers are concerning. Stolen from Pro Football Focus: Dallas center Travis Frederick has not allowed a sack in his last 1,658 pass blocks, since midseason 2014. That’s almost three full seasons of protecting Dallas quarterbacks on pass drops. 5:18 a.m.: Finish packing in downtown Westin. Leave room. Get in cab for airport. 5:39 a.m.: Arrive at airport. Go to TSA precheck line. Four people in front of me. 5:47 a.m.: Arrive at gate A11. Flight’s on time. Granted, the quick trip happened in part because of the insanely early hour I left my hotel. But trust me: Nowhere else in an NFL city can you leave your downtown hotel room and be at your airport gate in 29 minutes at any time of day. Not even close. We’re in the first month of a new section of the column called My MVP, as part of The MMQB’s partnership with State Farm. Each week, I’ll ask an NFL person what his most valuable possession is, and why. From “The MMQB Podcast With Peter King,” available where you download podcasts. This week’s conversations: Peyton Manning, on the verge of a statue of him being unveiled outside Lucas Oil Stadium in Indianapolis, and Steelers running back Le’Veon Bell.